– Any eviction notices must also be sent to the Housing Authority. 24 CFR 982.310(e)(2)(ii). – Does actual receipt cure service defects? – (3) Where the property has been sold in accordance with Section 2924 of the Civil Code, under a power of sale contained in a deed of trust executed by such person, or a person under whom such person claims, and the title under the sale has been duly perfected. Sale void if conducted in breach of loan mod. – Expiration of Bona Fide Lease? Tom Tenant’s 3-BR home in Sacramento, CA was sold at foreclosure sale on October 1. Tom’s existing lease expires on November 1, 2013. Under this lease, he pays $1,600 in rent each month under the lease, but the surrounding homes rent for about $2,300 per month. 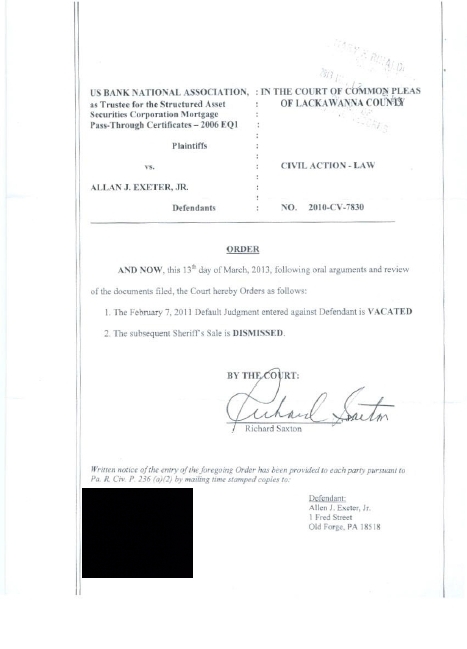 On October 5, Ivan Investor, who purchased the property at the trustee sale, served Tom with a 60-day notice to quit. Is the notice correct? – What if Tom was a Section 8 HCV tenant? – Or if Tom lived in Oakland instead of Sacramento? Homeowners who finds themselves in a situation where their lender is fraudulently trying to use cooked up documents to steal their most prized possessions “their homes”, needs to do whatever is necessary to stop these interlopers from stealing their homes. To do this, homeowners need to fight them to the finish in order to avoid the situation of change of status from “borrowers to tenants” as described above. Homeowners in wrongful foreclosures should do their best to reclaim what is rightfully theirs even if the lenders initially succeeded in foreclosing using fraudulent documents. It can reversed and dismissed by the courts through vigorous litigation, that’s where http://www.fightforeclosure.net comes in.